At MGS by Design we get asked all the time what our most popular granite colors are. We have a new feature *coming soon* here on the blog that will keep you all up to date on our most popular granite colors. I thought it may be interesting to show what our most popular stones from 2010 were though. Keep in mind these were our most popular colors. Every fabricator and market will have different results. I think Bianco Antico has been so popular mainly because of the rise in popularity of the White Kitchen this year. Bianco Antico has been a great alternative to the Carrara marble that homeowner's see in magazines but don't want to live with in their own homes. Bianco Antico is less expensive than Delicatus (which would definitely be in our Top 10 Granite Colors from 2010 if I were to expand this list), and I think that's another reason we did so much of it. Last, the Bianco Antico has some warm tones in it. These warm tones make it look great with dark brown cabinets and floors. I think it's obvious why the Cosmic Black has been so popular this year....it's stunning. I honestly don't know if I've ever had a customer walk by it and not love it. It may not be right for their kitchen, but it's such an amazing stone. Especially when you stop and remember it's a natural stone. It is a more expensive granite, but it's worth every dime (in my opinion!). It has some beautiful rust/ brown tones in it if that's what you are looking for, or you can keep your kitchen cool with the blacks and whites. I think Cosmic Black will continue to be one of our most popular colors in the coming years. Giallo Ornamental is a good neutral granite. With homeowner's now leaning more toward the light colors now, Giallo Ornamental has become a huge seller for us. It out sold the oh-so-popular Tropic Brown that was our biggest seller for years. Another reason for it's popularity? Price. It's the least expensive stone on this list. Giallo Ornamental is a fantastic color choice if you need to stay in the "Group 1" price point. It has light, it has dark. It has black, it has cream. There are beautiful rusts and browns. Golden Thunder is a dramatic, beautiful granite. If you are looking for a focal point for your kitchen, Golden Thunder will give it to you. Golden Thunder changes a lot from bundle to bundle and yet every bundle we get sells so quickly! These slabs aren't cheap, and even with our down economy they still flew out of our yard last year. Okay, I'm cheating a bit here. Carrara is obviously a marble, not a granite. I couldn't leave it out though as it was definitely the one of the hottest stones we used last year. It's classic, it's simple, it's gorgeous. It's hard to go wrong with Carrara. The rise in popularity of all white kitchens and baths played the largest part in Carrara's popularity. Also, you may be surprised with the price. It's a relatively inexpensive stone. So that's my Top Five from 2010. 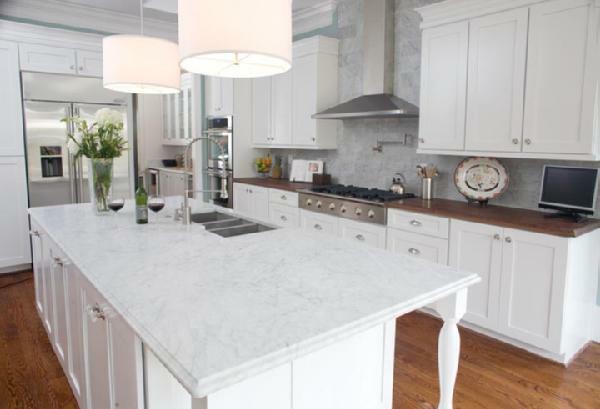 I should also note that quartz (especially CaesarStone) was a huge seller for us last year. Quartz is another product that I think we will only use more of in 2011. If you are in the Interior Design, Cabinet or Stone Industries I'd love to hear what your most popular colors were last year. Even if you aren't in the industry, tell me what stones you thought you'd see on the list! Really interesting and all beautiful selections (well, if I'm being honest there's one I really don't care for but I won't say which and I'll be a lot of people install it with an eye to selling their homes soon because I see it as being the "safest" of the options). Love this post and looking forward to the new series! 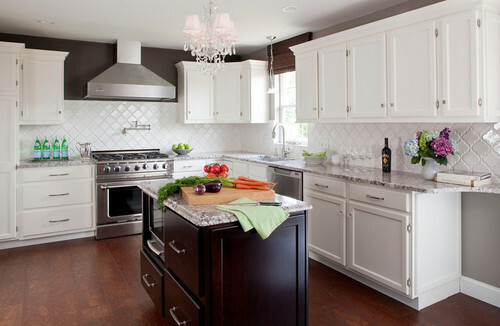 If you like my Bianco Antico kitchen posted here, please vote for it in this contest. It was a DIY project--total labor of love. Just click the link then the "thumbs up" button below the photo! If you like my Bianco Antico kitchen posted above, please vote for it in this contest sponsored by msn & febreze. It was a DIY project, total labor of love. Click on this link, then click the "thumbs up" button below my photo.